The hot days of summer are never that far away, and with that comes the potential for an overheated vehicle. An overheated car is not only inconvenient, it can lead to costly repairs in the long-run and ultimately compromise your safety. Here are some ways to keep your car running cool in the summer heat. Check your coolant levels, especially if you’ve been dealing with a heat wave. If you’re running low, top it up! Also be sure to check the coolant colour. While coolant comes in a number of different colours, it should not be milky or brown. Milky coolant means it’s time for a flush! Make sure your radiator is functioning properly. The radiator’s job is to keep your engine running cool. If it is isn’t functioning properly, you’re fighting an uphill battle. Like any vehicle part, radiators wear out, get clogged, and spring leaks. Be sure to have your radiator checked as part of your regular maintenance schedule to avoid any surprises come summer time. Park inside or in the shade. Every little bit helps. Parking your car out of direct sunlight ensures that you aren’t “pre-heating” your engine. Look into different aftermarket products such as coatings, exhaust wraps, and thermal barriers, especially if you have an older vehicle. These products work to better insulate certain components, limiting the amount of excess heat in the engine. Be sure to consult a professional to find out which products are best for your vehicle. Check your battery. Older batteries are less efficient and need to work harder to keep up with vehicle demands. The result is excess heat. If you know that your battery is getting old, replacing it before a major heat wave is a smart idea. Turn on the heat. If it’s a hot summer’s day this seems like the last thing you want to do, but turning on the heat actually helps to pull hot air away from your car’s engine. This is a good trick to use if your engine is overheating and you need to cool it down. Keep an eye on the engine temperature gauge. 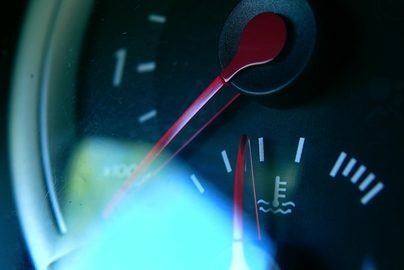 The last thing you want is to overheat your engine to the point of stalling the car, so if you notice that it’s starting to creep up, pull over, turn off your car, and let the engine cool down. If your car overheats at any point, be sure to take it into a mechanic as soon as possible. The expert team at Park Muffler can help with preventative maintenance as well as necessary repairs to ensure that your car keeps running cool throughout the summer.